At night, the streets of Hamra and Gemmeyzeh are lined with expensive cars. People of all ages can enjoy alcoholic beverages in bars playing the latest R n B musical ‘songs’. These streets are also occupied by young children trying to sell flowers and chewing gum. At first,I found the contrast between smooth rolling Mercedes and glimmering iPhones next to 10 year old kids trying to sell roses to be disturbing. In fact it still disturbs me. And so it should. I developed an interesting bond with some of these young fellows after I started taking my guitar out into the street to perform. I never do it for the cash, I just like playing the guitar. The flower seller kids usually gather round, try to encourage passers-by to give me money and generally seem to enjoy that someone else is trying to whore themselves out for public enjoyment. There is one kid who thinks he is 50 Cent and likes to rap over my guitar playing. He is about 14. After one particularly successful jam session (think Jimmy page meets Puff Daddy meets several bottles of Famous Grouse whisky) I tried to give little Busta Rhymes the money we had made (about 20,000LL). He refused to take it. No idea who this kid is. Found the pic on google. I don’t think anyone is under the impression that these children are actually ‘homeless’ and sleep in dark alleyways. But I at least had never given much thought as to who they actually work for. Until last Friday that is. On a one man mission to prove that Bob Dylan is better than Lady Gaga, I was belting out the tunes accompanied by my usual flower selling chums. 50 Cent kid shows up, walking with a golf umbrella like a cane. Total pimp. 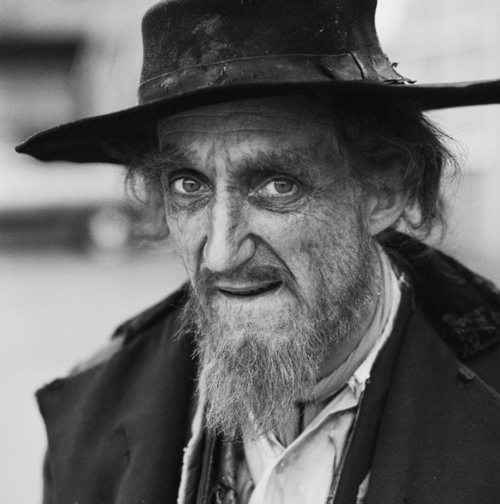 I must have looked like the Fagin of the iPod generation. As one of the kids was trying to explain (in Arabic) that I should push the guitar case further into the street to get more money, a strange character walked past. Me on a Friday night. He was built like the terminator, biceps bigger than my thighs, hair scraped back into a ponytail. He grunted an order at the flower boys. The kids jumped up, literally terrified of him, and ran off to their previous positions with their roses. Muscle head looked me in the eyes, smiled, put his hands together as if saying a prayer then strutted off down the street. Perhaps he was their Dad? 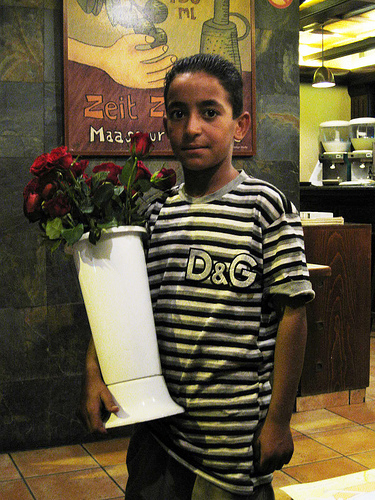 This entry was posted in Uncategorized and tagged beirut street children, fagin, flower seller, homeless. Bookmark the permalink. I never know what to think about this whole thing… disturbing, definitely. And just really sad, I’m kind of surprised it’s not addressed more often since everyone in Lebanon encounters these kids at some point. 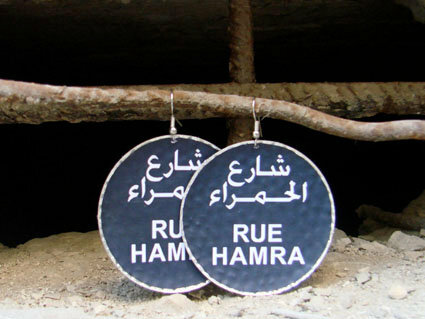 I think like with many things in Lebanon, its something that everyone kind of becomes oblivious to. Just keep your windows rolled up, AC on and ignore them.. especially the ones that aren’t selling anything, just banging on your Mercedes window or hanging out on the step of your Hummer as you inch towards the left turn in traffic in hopes of getting a couples bucks out of you. Hi Christina. Well yeah, it bothers me too. But I don’t really know what to think either. Most of those kids don’t actually seem that miserable if you talk to them, they are pretty cheeky actually (in a good way). A friend asked one of the Hamra kids where they lived and he said Sabra, but other than that I have no idea what they get up to. When my bestseller book deal comes through (ahem) I will use the cash to buy them all instruments and pay for lessons then at least they may have a chance at rock stardom.